There are more castles in Aberdeenshire than anywhere else in the UK or so it says in the guide book I got from the tourist information centre in Aberdeen. 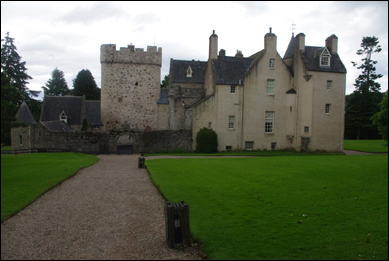 There is also a castle trail (the only one in Scotland) which takes in eighteen of these magnificent buildings. I looked at the few photographs that were in the book and they certainly looked stunning so I resolved to find the trail and photograph as many as I could. I downloaded a pdf of the trail from the internet and on the morning of 17th July (yesterday) I set off for the first on the list. 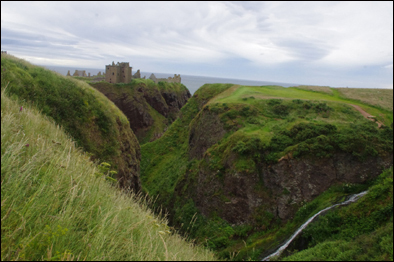 This was Dunnottar Castle near the village of Stonehaven which was only about 16 miles south of Aberdeen and the Rosemount Palace. Unfortunately there was a steady downpour of rain but undeterred I set off thinking I could take some long range shots from the window of my car. When I got there the view was spectacular despite the rain and I needed to get out the car for a better look. I took several photographs and then the elements got the better of me and I beat a hasty retreat to the car soaking wet despite the waterproofs I had donned. 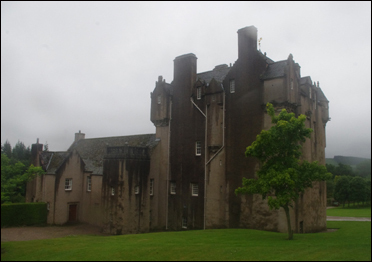 The rain had eased off a little by the time I got to the second on the list, Crathes Castle, and I could take my time in taking my shots. 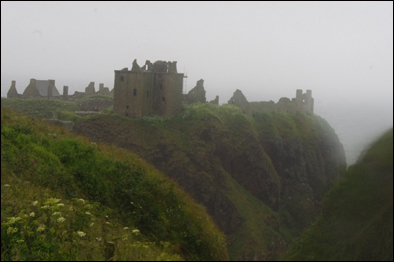 When I had finished, I decided that I had done enough that day and hurried back to Rosemount Palace but when I looked at the pictures I had taken of Dunnottar I found all but one had been obscured by the heavy raindrops on my Camera lens. The next day (today) the sky was dull but it was not raining so I set out for Stonehaven again and got the photographs I wanted. 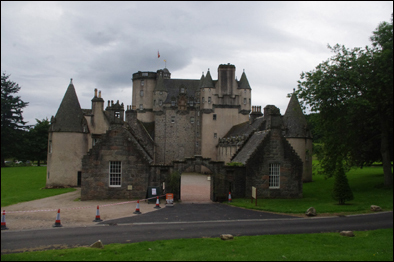 Then I took in two more castles on the list, Drum Castle and Castle Fraser. My photographs do not do these wonderful structures justice. Each building undoubtedly has numerous stories attached to it. I am afraid I had no time to research them as my sole purpose was to capture their images. Instead I refer you to a website http://www.visitscotland.com/download/scotlands-castle-trail-pdf where you can find out more about this fascinating trail. This entry was posted on Saturday, July 18th, 2015 at 11:10 pm and is filed under Travel. You can follow any responses to this entry through the RSS 2.0 feed. You can leave a response, or trackback from your own site.